10 Best Tropical Islands to Visit -- And Where to Stay! 10 Best Tropical Islands to Visit — And Where to Stay! Looking for the best tropical island for your next vacation? We’ve gathered our top 10 picks with some of the world’s most gorgeous beaches. These are the most beautiful tropical islands to visit and insider tips on where to stay on each island! If you’re a budget-minded traveler looking to save money on your next tropical island vacation, we always check rates on AirBnb whenever possible. However, keep in mind that sometimes a hotel is the best choice for a particular destination. We give our suggestions of places to stay in each of the destinations below. Bonus: Sign up through this link and receive a free credit for your first Airbnb stay! Bali will always hold a special place in my heart no matter how well known it becomes. Some of my favorite beaches are now changed forever as a result of the movie Eat Pray Love, but that won’t stop me from visiting again. It’s a destination where you will find welcoming locals, breathtaking beaches and, of course, epic surf. This honeymoon escape sits right on the beach and it’s only $103 per night! If you create an account with our link, you can get an even bigger discount! We have been to Maui three times and we’re going on our fourth visit in November. That’s how much we love it here. What is not to love? The hang loose island vibe is contagious and leaves you feeling recharged even after just a short visit. 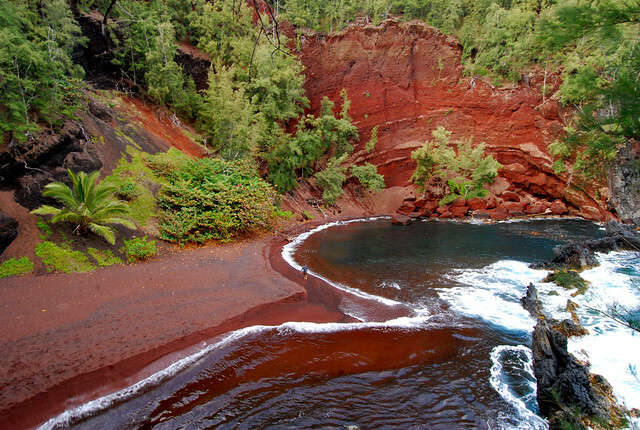 If you have time, make sure you venture all the way to the Seven Sacred Pools on the Road to Hana and don’t miss a stop at Red Sand Beach! Our favorite hotel on Maui has some of the best snorkeling on the island and we ALWAYS see turtles here! We’ve found the best prices for the Sheraton Maui on Booking.com. Read more: How to Travel to Maui on a Budget. Bora Bora is nicknamed “the romantic island” (it also made our list of the most romantic islands in the world) and from viewing photos of this tropical island, I can see why. With perfect white sand beaches, overwater bungalows and emerald-colored ocean water, it’s a true paradise. If you want to experience the ultimate luxury, then you can’t beat staying at the Hilton Bora Bora Nui Resort & Spa. Read more: Moorea Travel Guide – Tips For Visiting Moorea, Tahiti on a Budget. Fiji is a must visit for many surfers, including us. Of course, Fiji is known for more than its perfectly peeling waves and warm water. Our friends visited during their honeymoon and said it was the perfect spot for a romantic getaway. The smaller islands with nothing to do but sip drinks by the gorgeous ocean were their favorite spots. A trip to Fiji doesn’t have to break the bank. The Sofitel Fiji Resort & Spa offers rooms for as low as $200/night and gets excellent reviews! Aruba is a small island — just 19.6 miles long — and boasts ideal temperatures year round, thanks to the constant trade winds (which helps with the humidity and limits the annoyance of mosquitoes). When travel to other islands in the Caribbean is dicey, Aruba is the optimal choice because it is located in the Netherland Antilles, outside of the hurricane belt. I stayed for four glorious days at the Aruba Marriott in Palm Beach. See our full review here or book your stay now! Ever since I was a child, I have longed to visit the islands of the Bahamas. Nassau is one of the more well-known islands, but certainly not the only island to visit. With 30 inhabited islands, there are plenty of spots to choose from. AirBnb has a plethora of listings in Bahamas. We personally love the island of Eleuthera, where you can find beach cottages staring at $150 per night. Sign up through our link for a credit towards your first stay and then start searching on Airbnb’s site! Turks and Caicos consists of two groups of tropical islands in the West Indies. These islands are still under the radar for most travelers, but being situated just 90 minutes away from Miami, it’s only a hop, skip and a jump for United States East Coasters. Villa Del Mar offers condos with a gorgeous pool for a reasonable price. The Maldives is located in the Indian Ocean and is the smallest Asian country in both population and size. What this country lacks in size, it makes up for in beauty with some of the most gorgeous dive sites and beaches in the world. The government follows a “one island, one resort” policy and limits the height of the resorts to be equal or lesser than the tallest tree. This hotel and spa is a great price for the Maldives and it gets glowing reviews. The Seychelles are a group of 115 tropical islands which lie in the enchanting Indian Ocean, just east of mainland Africa and northeast of the island of Madagascar. The climate here is always warm, with temperatures rarely dropping below 75 degrees or rising above 90 degrees – making it a perfect year-round destination. Doubletree by Hilton Seychelles is in a stunning location and offers very reasonable nightly rates. Fernando de Noronha is a tropical island in the Atlantic Ocean off the coast of Brazil. Noronha formed as a result of volcanic activity and initially the island was used as a prison for convicted Brazilians. The number of people allowed on the island at any one time is strictly limited to 420 people, so plan your trip early! Want to know how to travel the world? I’ve put together a page full of useful travel resources with tips and tricks I’ve learned after consistently traveling for over ten years. Learn how I get paid to travel the world, how to find the best prices on flights and accommodation, my best travel tips, how to start a travel blog, and more. Next Story → Cenotes, Caves and Ziplines – Oh My!